The best way to avoid serious issues with the sewer system at your residential, commercial, or industrial real estate is to hire a professional plumbing contractor, like Nu Flow Technologies, that specialize in preventative property maintenance procedures. For example, a yearly sewer camera inspection is the only non-invasive way to find out exactly what is going on with the sewer pipes that are buried deep underground. Thanks to recent advances in sewer video camera technology the days of unexpected major sewer emergencies can be long gone. Property owners no longer need to go through the extremely unpleasant experience of raw sewage and wastewater flooding the interior of their homes, places of business, or investment properties through the toilets, water faucets, and drains. Worrying about cleaning up after that hazardous mess, getting sick from exposure to the sewer gas, raw sewage, and wastewater can be things of the past as with a video inspection. When you schedule a sewer camera inspection in St. Louis, Missouri with a professional plumbing contractor, like Nu Flow Technologies an experienced technician will arrive at your property at the designated day and time. They will insert a flexible rod into the sewer system through an easy to get to access point such as a drain cleanout. A small, waterproof, high-definition video camera is attached to the end of the rod. The rod is flexible enough that it can be fed into the entire sewer pipeline including any bends, corners, or turns. As this is occurring the camera is taking crystal clear video images of the interior conditions of the sewer pipeline. The video images are relayed back to the technician in real time where they can be viewed on a laptop computer or other portable electronic devices such as a tablet, or smartphone. At this point, the technician is able to discover even the smallest issues or potential problems. Chances are you will receive a clean bill of health and have the peace of mind of knowing that your sewer system is in good working order. That being said, if small problems are uncovered they can either be fixed immediately or tracked with future sewer camera inspections depending on the severity of the situation. If larger issues are exposed they can be fixed prior to turning into a major sewer related disaster. The entire process takes less than an hour. The property owner will be supplied with a digital copy of the video inspection for their records. The plumbing contractor will save it on file for future reference as well. We would like to guide you through the entire process from start to finish. 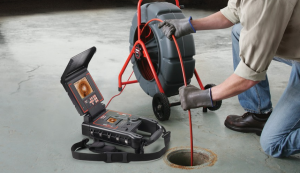 Please contact your local Nu Flow Technologies location in St. Louis, Missouri for further information, or to schedule a sewer camera inspection at your property. We look forward to working with you.